River Birches is owned and operated by Jason and Rebecca, your warm and charming hosts. On our arrival, Jason was immediately on the scene as soon as we had entered the Lodge driveway (quite possibly just good timing, but we will assume it was actually great customer service). Reached through impressive green gardens. After a brief introduction to the Lodge, we were promptly settled into our room which was welcome after a big day of activities and driving from Hamilton, where we had attended the wedding of our friends. For our first evening we had booked two seats at the Lodge dinner. Your place at dinner must be secured by prior arrangement. There is a limit of 8 places, so if the Lodge is reasonably full, not all guests can partake. Anthony, the Lodge Chef, served a delectable four course affair. We started with a traditional New Zealand tasting plate of local produce including mussels, chorizo, dips, fine cheeses and various other accompaniments. Next came the entree, a simple, but rewarding, pumpkin soup. For main we both had the fine New Zealand salmon while many of our fellow guests enjoyed the lamb which was equally well received. And dessert, although almost unmanageable after the preceding three courses of decadence (almost), was a carrot cake doused in sticky caramel sauce and vanilla bean icecream. Catering for a maximum of 8 guests for dinner. 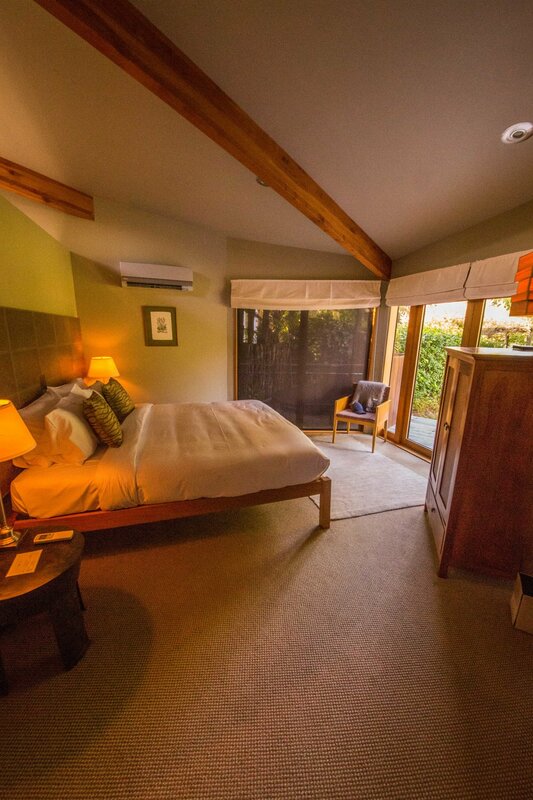 The Lodge contains three very well appointed and extremely comfortable guest rooms. They are known as the Admiral's Room, the Major's Room and the Duchess's Room. Each includes a super king-size (and super comfortable) bed, ensuite with bath, wifi, sound system, central heating for winter and air conditioning for summer. The Major's room is separate from the main building and includes a small private garden outside its ensuite. The other two rooms are part of the main building which also includes the communal lounge, communal dining and the open kitchen (though the kitchen is not available for personal use). 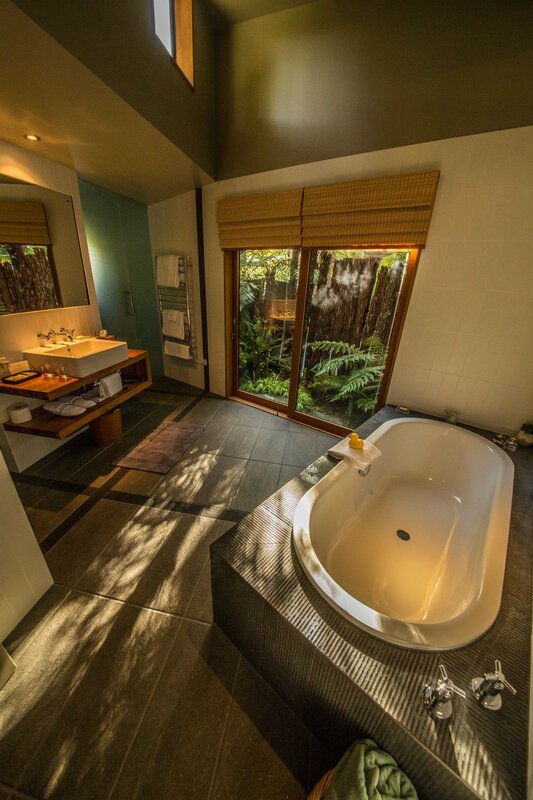 We chose the Admiral's Room which has the added bonus of an outdoor hot tub. We are sure the hot tub would get most of its use in the cooler months. But even when the weather isn’t quite as cool, we found it a very welcome amenity after a long day volcano climbing on the Tongariro Crossing (see our post regarding Things To Do on the North Island). The Admirals Room's Bedroom looks out over the amazingly green garden. The Admirals Room is air-conditioned, and includes a discreet, satellite connected TV. Well stocked with fine New Zealand wines, artisanal sparkling water and a micro-brewery beer selection. With large bath and central heating. Very welcome after a long day trekking the Tongariro Crossing. 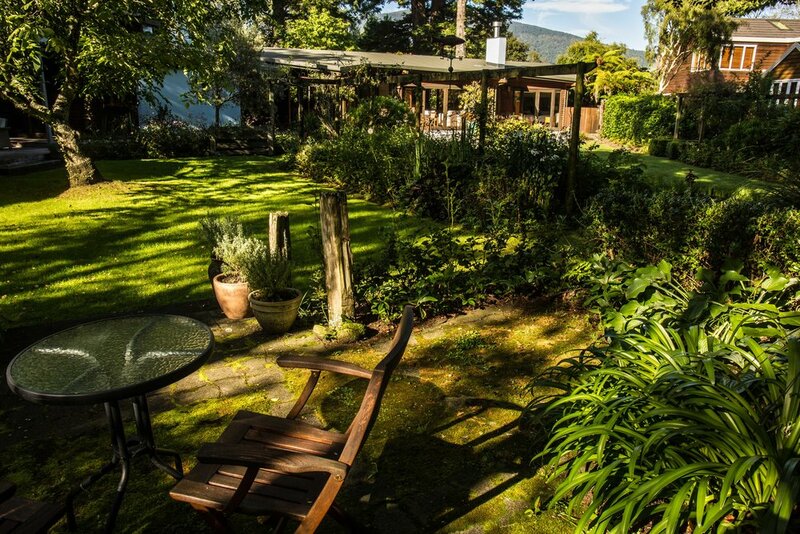 There is also the Cottage, which is next door to the Lodge, though you can pass between the two via the beautifully manicured and impressively green gardens. 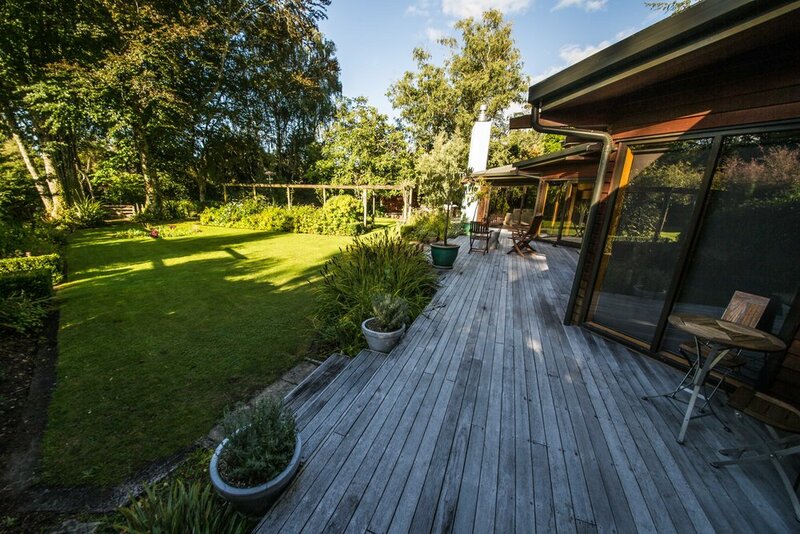 The Cottage is self-contained and includes three rooms catering for three couples. You can cook your own meals, or you can chose to enjoy dinner in the Lodge with the other guests (subject to availability and at additional cost). Breakfast is included for all guests of both the Lodge and the Cottage. § The Admiral's Room is right next to the communal guest lounge. And for those guests lucky enough to enjoy dinner in the evening at River Birches, dessert is served in the lounge (in front of the fireplace if the weather requires, which we suspect is quite often). So if you are part of dinner on a particular evening, it is a very enjoyable experience, meeting new people while enjoying fine food, a fine dessert, coupled with fine wine if you wish. However just be warned, if you aren’t part of dinner that evening, there will be a bit of noise outside the door of the Admiral's Room. We didn’t experience anything that went unacceptably late, but I’m not sure the Lodge polices the post dinner festivities, so we suspect there is a risk of the occasional "party" going a bit late. 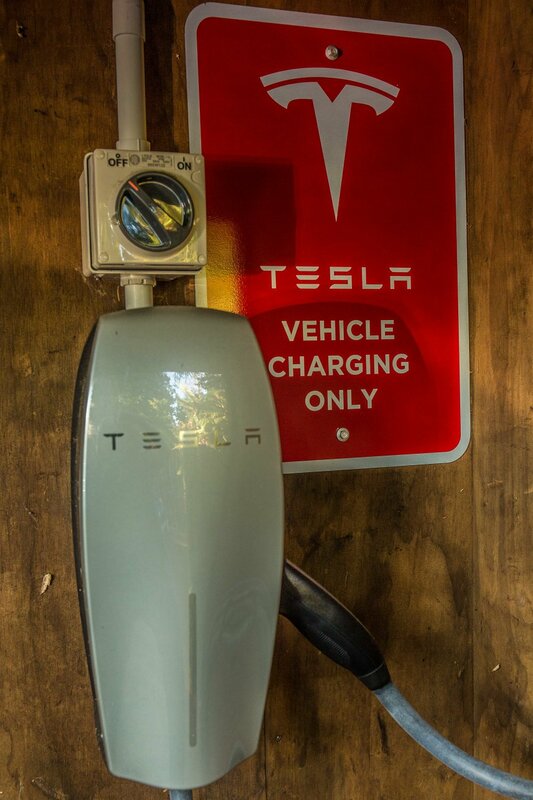 § The Lodge includes a Tesla car charging station. Including some fine detail elements. Including a number of appealing spots to sit and contemplate. The Cottage and the Lodge are connected via a walk through the greenery. Each of the Lodge Rooms have a seating area on the building long deck. A Tesla vehicle charger is available for those in need.